From the grand opening of the Laurier-Brantford YMCA, to graduating nearly 4,000 students at convocation, and finally, ranking No.  1 in student satisfaction by Maclean’s Magazine for the third year in a row, Laurier had much to celebrate in 2018. But the Laurier experience is best told by the stories of our students' successes and the impact our researchers are making in the world. Got ink? Economics professor Bradley Ruffle and psychology professor Anne Wilson conducted a study that concludes people with tattoos, particularly ones that can’t easily be covered up, are more impulsive and short-sighted than people without. New paramedics seeking employment and paramedics returning to work after extended absences will now be able to take an evidence-based physical abilities test developed by a team of researchers in close consultation with working paramedics, including Laurier researcher Renée MacPhee. For the third year in a row, Laurier has been ranked No. 1 in the country in its category for student satisfaction in the annual Maclean’s Rankings of Canadian Universities. In spring 2018, Laurier’s Lyle S. Hallman Faculty of Social Work launched its prestigious Master of Social Work (MSW) degree in a fully online format. The MSW is one of Laurier’s signature programs and has a longstanding reputation for specializing in critically reflexive clinical and community practice. Jack McCormick, a fourth-year co-op business student and co-founder of Eye to Eye, is an honour roll student who has won numerous awards and scholarships for his extensive volunteer and leadership experience as well as his academic achievement. He also has a vision impairment. He's focused on eliminating the stigma associated with vision impairments and disabilities. Laurier's first-ever student to earn a PhD in Kinesiology, Brianne Redquest, is shining a spotlight on lesser-known autism-related issues around motor deficits and other health conditions. Laurier researchers Paul Mallet, Bruce McKay and Sarah Wilner are studying the challenges and opportunities related to legal cannabis. 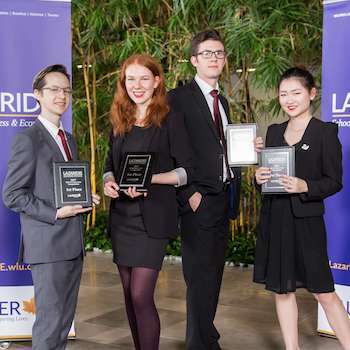 Four first-year double-degree Lazaridis School students Hayden Carver, Tristan Donelle, Natasha Kasunic and Erica Yang, won this years TD Case Competition. Their winning case proposed that TD implement “MyAdvisor” — a virtual personal banker for each customer. TD offered summer jobs to each of the four first-year students and a scholarship. Laurier grad Elizabeth Clarke has been through more challenges in her 21 years than many people experience in their lifetimes. Taken into foster care at a young age, she was later adopted, only to lose her father at the age of six and her mother this past winter. The supportive community around her at Laurier helped her keep going – and thriving. 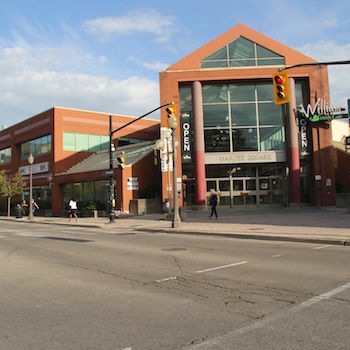 Market Square on Laurier's Brantford campus will be transformed into new academic, cultural and service spaces to support continued growth at the Brantford campus.